Author and poet, Georgia McDade on the bus. 61 years ago on December 1st, Rosa Parks, a black seamstress was arrested in Montgomery Alabama for refusing to give up her seat to a white man on a city bus. The incident sparked a year-long boycott of the buses by blacks, leading to the end of segregated buses in the south. 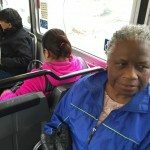 Next, we hear from Seattle writer, Georgia McDade who grew up in the south and remembers her experience using the segregated bus system.